It seems like a real luxury doesn’t it? Having a steam room or sauna in your own home used to be considered very much a luxury add-on but is becoming more and more popular now. Would I do this if I had the space? In a heartbeat! Having the chance to unwind and de-stress in my very own steam room would be my idea of heaven, how about you? 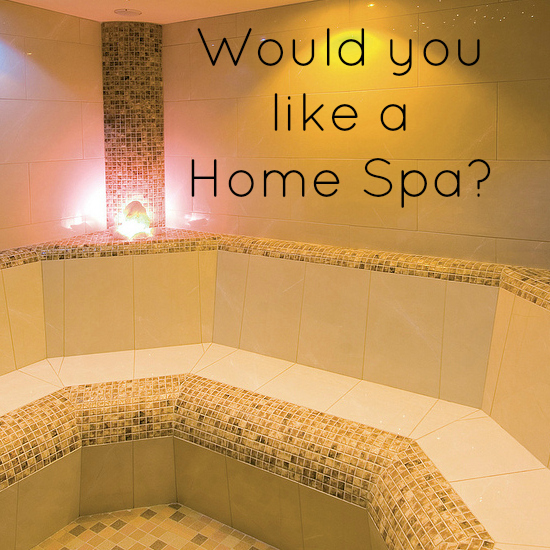 If you are thinking of installing a home spa what do you need to consider? I’ve put together a few tips on what to expect and what’s available. If you’ve decided to go for a home sauna you can buy one ‘off the shelf’ or you can have a company design you a bespoke one that fits your room and interior design specifically. It will include well thought through lighting such as LED’s or even fibre optics as well as the use of different types of complimentary wood that suit you and your décor. If you just want ease of installation then buying a predesigned, ready built sauna is the way to go, and will help you achieve your home spa dream in the shortest space of time. Many pre-designed saunas are very contemporary now too and don’t look like the stereotyped sauna cabin. And many are designed to fit into the smallest of spaces. They can even look like a shower cubicle which dispels many preconceived ideas. Finally don’t forget you can add in the all important accessories too like oils, fragrances and ladles and buckets to really give you an authentic spa experience. Apparently the demand for a bespoke tiled steam room is growing all the time. If you enjoy visiting the spa and steam room in particular as much as I do then this is well worth considering. A bespoke steam room can come with mosaic tiling, mood lighting and even in in-built music system! Of course, this option won’t be your cheapest and many projects like this are priced on an individual basis. As with the home spa, some steam rooms come ready made and ready to install for 2 to 50 people and many are also suitable for wheelchair users. Accessories here include specialist cleaning equipment as well as the right lighting. steam guards and audio speakers. Could you see yourself with a home spa? Budget allowing of course. With more of us staying in and making the most of our homes, this is one way to really add a touch of luxury! I’d love a steam room in my house – there’s just something so calming about sitting in a steam room at a spa. Having said that I’d have to buy a house first and that’s a long way off!